A very high quality Salon Kit which comprises of all the metal beauty implements needed by an esthetician to carry out his/her professional duties. You have everything in one place here. 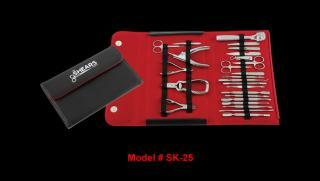 Comes in a beautiful leather casing which holds all the tools. Is available at an excellent price too at The Shears Depot.